Easter is almost here, which has many of us thinking about those Easter baskets, right? I always loved Easter baskets--- opening them to discover what fun surprises were inside! What's not to love!? Wouldn't it be great if we- as adults- could get that same Easter basket feeling now too? Well, who says we can't!? Sure, we may be the moms now, but everyone loves a good surprise now and again... and with subscription boxes, that's just what we get! The theme for this Box of Blessings – Miracles & God’s Glory – is captured in one verse, Psalm 96:3: “Declare His glory among the nations, His marvelous work among all the peoples.” God is always working in our lives. Sometimes we see it in “big” miracles…many times we see it in “small” miracles. Whether it’s a “big” miracle or a “small” miracle, when we share what God has done in our lives it reveals His glory. Our God has always been and always will be the God of miracles. 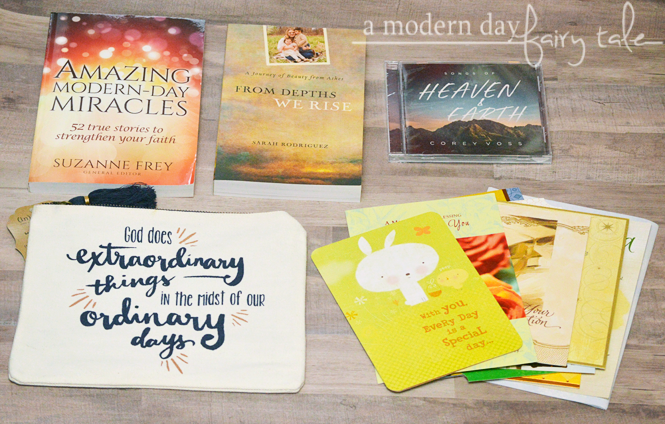 This box includes: From Depths We Rise by Sarah Rodriguez, Amazing Modern Day Miracles by Suzanne Frey, Songs of Heaven and Earth by Corey Voss, an Extraordinary Things Pouch by Dayspring and a 10 pack of Spring Greeting Cards. This box has a retail value of $86.17!! What a blessing! "From Depths We Rise". I love a good story of overcoming obstacles. No, I NEED a good story like this every once in awhile--- a reminder that no matter what we go through, God is there and will be there through it all. "Amazing Modern Day Miracles". Another great read in this month's box. We so often think about the miracles in the Bible, but this book will remind us that miracles can and do still happen even today! Spring Greeting Cards Pack. I love that this box is not just a blessing to the person who subscribes, but allows them to bless others as well. These cards are a great way to do that! They allow us to share God's word and put a smile on someone's face! Songs of Heaven and Earth by Corey Voss. More great music to experience and for me, one that I was not familiar with before! It's always great to try out a new artist that I might not have before! But aside that the songs fit perfectly into the them of this box. Extraordinary Things Pouch. This is perhaps my favorite item in this month's box--- perfect for makeup, keeping your purse organized, coupons--- you name it! All in all, this box serves as a great reminder that God is always working. Sometimes its in the big things, sometimes in the little things--- but He's always there working things according to His plans. I think we all need that reminder every now and again, don't we? It's easy enough to see that God is working when something big happens, or when all of our prayers are seemingly answered in a timely manner. But when things take awhile, or when it seems like things just aren't going planned? That can be a little more challenging. These products remind us to truly stop and take a moment to remember what God has done in our lives- big or small- it's all Him. And God's work in our lives? Well, that's something that is certainly worth celebrating throughout the Easter season and beyond. 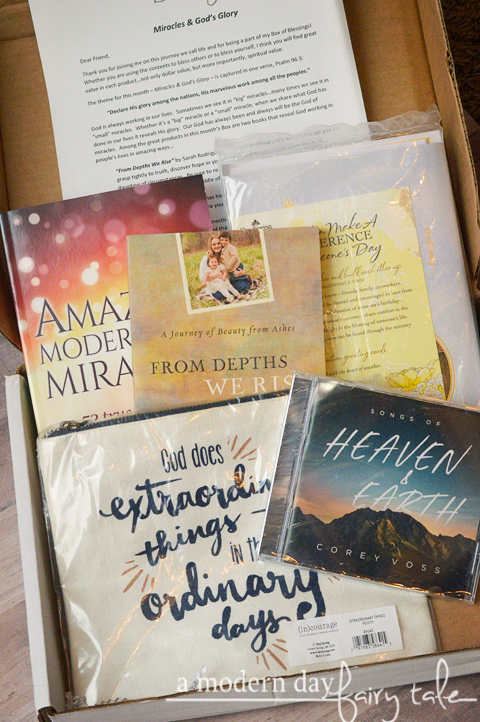 Want to see more great boxes from Bette's Box of Blessings and get YOUR subscription started? You can learn more and get started here.And don't forget to use the code FAIRYTALE to take $5 off your first box! Head on over to take advantage of this amazing deal. How has God been working in YOUR life lately? I'd love to hear all about it in the comments below? How could Bette's Box of Blessings help you to grow your faith or bring blessings to others every month? I think subscription boxes are fun but I don't like the monthly commitment. I am a commitmentphobe! This does look lovely, though.